After the recent success of Google+ Followers gadget for Blogger, Google is ready to add yet another fabulous functionality. If anyone is using Blogger Platform for daily personal or corporate writing, then they would be pleased to see that it has received a bit more Social treatment from Google Plus. This functionality allows a person to mention any Google+ user within the article. It’s an ideal way of magnetizing quick attention. On the other hand, it will also help in providing context to your content. There is no doubt that Google is playing all its tricks to dominate the Social Web, and Blogger is ideal for their promotion because it is one of the widely used by tons of Bloggers. Now you can add a link to a Google+ profile or page when you want to mention someone in a post. If you then share your post from Blogger to Google+, we make it easier to notify your mentions by including them in the sharebox. A person can use this feature when he is writing a post in the Blogger Post Editor. It will send notifications to the tagged user. There are no doubts that it would bring more audience to your website, but this does not mean we should start tagging unwanted personalities because it would be considered as Spam. We should take extra precautions before tagging a user in our articles otherwise we would be unable to use this splendid feature in future. To mention someone, just type “+” in the blogger post editor and then write the name of the Google+ user. 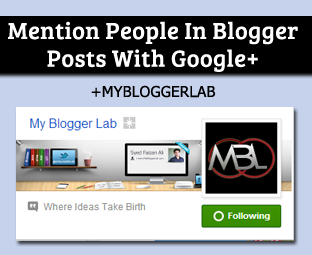 For Example, whenever a person would write +My Blogger Lab in the blogger post editor it would display list of names or communities that are related to “MyBloggerLab”. We have attached a screenshot below so people can easily understand what we are trying to say. Whenever, users will hover over the tagged Google+ page or profile it will display a Small card with more information about the user and an “Add to circle” button. Clicking the link would redirect users to Google+ profile or page. We have attached a screenshot below so everyone can understand without any hassle. In order to use this functionality its must that a person should connect his Google+ profile with Blogger, otherwise he would be unable to use this robust functionality. However, we are trying our best to develop the script that allows users to utilize this feature without connecting to Google Plus. We will update everyone once it’s done. We are speechless to see these new functionalities. It’s time to fasten your seat-belts because the time is near when we will be able to integrate Google+ Commenting system in Blogger. That would be awe-inspiring, especially if it synced with comments on the shared post to your stream. So, never ever underestimate Blogger Platform. What are your thoughts about it? Take a lot care till then, Peace, Blessings and Happy Googling. old this maravillouses gadgets, cut be placed in spanish?